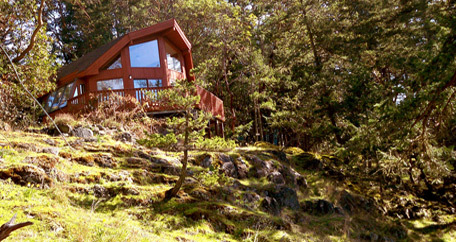 A very private guest cottage in a beautiful nature setting of south Salt Spring Island, B.C. 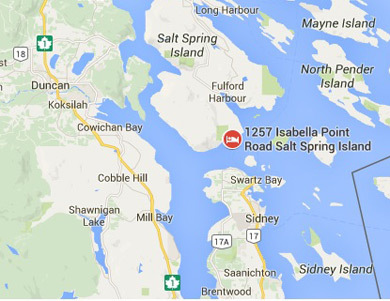 This Southern Gulf Island cottage is located in the Salish Sea on Satellite Channel at the southern tip of Salt Spring Island.The Fulford ferry terminal is nearby. It is on a large sunny oceanfront lot at the top of a slope with a magnificent ocean view. Hiking trails are at the door. Forest and marine wildlife are plentiful including resident eagles and deer, providing great wildflower and bird-watching opportunities. Our forest slope is very beautiful with mossy knolls that are emerald green after rain and bleached to gold in dry weather. Our trees are large Douglas Firs, Garry Oak and Arbutus - Madronas to folks south of the border - typical of this south-west facing oceanfront terrain. Salt Spring Island is the perfect getaway if you are seeking peace and tranquility as the island has forests, beaches, mountains, lakes and rolling countryside. It's a great place to view nature and the wildlife. The island offers an alternative lifestyle and is renowned forits arts and crafts and the local produce available at the markets. Our part of the island has a sub-Mediterranean climate. We rarely have snow and if we do it is usually gone by the next day. Snowdrops are out in January, other winter flowers begin earlier. Daffodil season begins in February and lasts until late March.